The Flagler Trail Master Plan Study was presented last week to the City of Miami Beautification Committee. The goal is to create a north-south trail running from downtown Miami to Aventura, a presentation stated. It will be designed for bikes and pedestrians, and not for motorized traffic. Six transit stations along the route will be connected, allowing for first mile/last mile connectivity for non-motorized travel. The total length of the trail would be around 14.5 miles, starting from around Brightline’s new MiamiCentral station to Aventura. 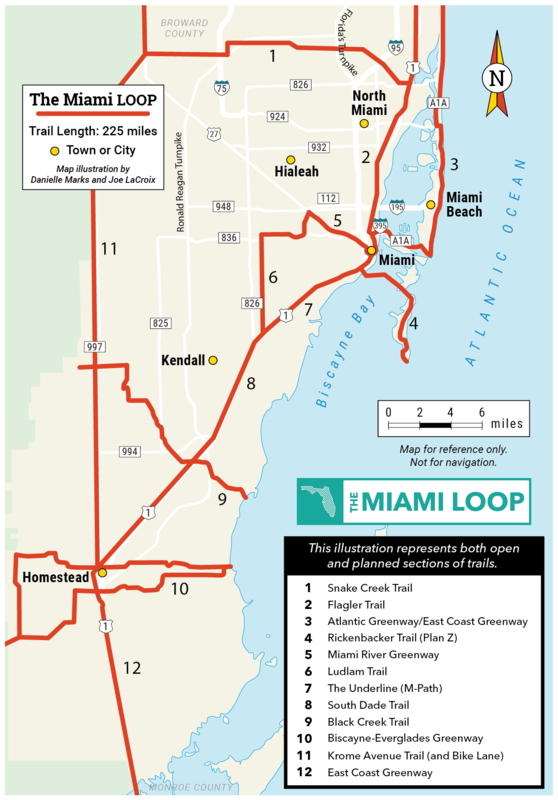 According to Friends of Flagler Trail, it would be part of a much larger 225 mile pathway known as the Miami Loop connecting much of Miami-Dade County. This is exactly the kind of development needed to balance the density and connect our communities and to provide us all with safe pedestrian friendly alternatives! Kudos to all involved!! God forbid you use it for leisure/recreation. 10 mile 30 minute commute… how fat are you. All over the civilized world (Europe, Asia, and Latin America) including much worse climates than Miami, there’s infrastructure that supports public use of cycles. Miami seems not to be in the civilized world. As long as it is designed with electric scooters in mind. And only one year of studies if they wanted to build a highway instead. And only two weeks if it were a double-decked one. Running along the FEC tracks. Sounds like a plan. A pedestrian/bike path under the Miami River is needed. How about we get Tri-Rail running on those tracks? Stupidest suggestion ever. Trirail Coastal Link is never happening. Now THIS is some Public Transportation that I can really support. If this can keep the whiners from whining, i’ll vote for 2 of them! Bravo to our friends at Miami-Dade TPO & Gannett Fleming for advancing this concept. The FEC Corridor should definitely house a bike trail and a walking trail! Long overdue. Respect for history and Lemon City and Little River.